Devon & Cornwall Notes and Queries vol. VII, (1912-1913), Exeter: James G. Commin. 1913, illus. p. 57. Royal badges have been in use since the earliest stages of English heraldry. They are invariably simple devices, and numerous examples were adopted and inherited by various sovereigns. These are found in the glass and fabric of royal palaces and memorial chapels, and sometimes in the houses of those who enjoyed or anticipated royal patronage. Badges came into general use by the reign of King Edward III. The king himself deployed many badges alluding to his lineage, as well as new personal devices. King Henry VII (Tudor) used a variety of Badges. These were as follows: Portcullis Or, crowned (from his mother; Margaret Beaufort); a Greyhound Argent, collared Gules (for the Earldom of Richmond); a Red dragon of Cadwaladr; a Dun cow (of Warwick); a Crowned hawthorn bush with the cypher H.R. 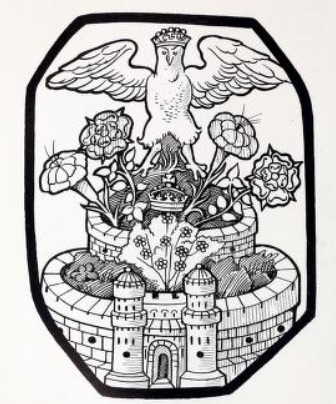 (recalling the story after Bosworth, when the crown was found under a hawthorn bush; the Tudor rose; a rose Gules, with a rose Argent superimposed, crowned; a Fleur-de-lis, Or, crowned; Flames of fire; a Sunburst, and a Falcon standing on a fetterlock, with a virgin's face (a harpy). The article, from a copy of a rare and much sought-after journal can be downloaded from the Internet Archive. Google has sponsored the digitisation of books from several libraries. These books, on which copyright has expired, are available for free educational and research use, both as individual books and as full collections to aid researchers. Note 32. THE BADGES OF KING HENRY VII. - In a window at Bovey House, Beer, there is a pane of early Tudor stained glass showing a combination of some of the badges of King Henry VII. and Elizabeth of York. These comprise the roses of Lancaster and York, a crowned eagle, a Tudor castle, K. Richard's crown in the hawthorn bush at Bosworth Field, and two carnations or "gilly flowers." I have not been able to identify this flower as a Tudor badge, though it has been suggested that - from its name - it is emblematical of the Coronation of the King and Queen. Can any of your readers make a suggestion as to the reason that induced the glass painter to include these flowers in his carefully executed and quaintly drawn design?